If you want to capture the spirit of the 1960s Folk Revival, you should start with this wonderful CD. 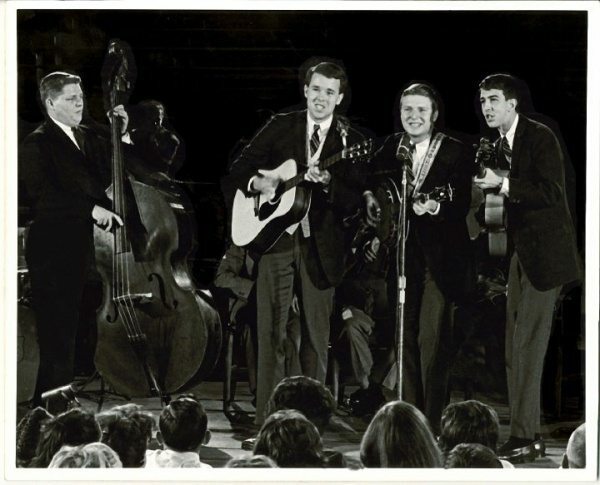 Sure, groups like the Kingston Trio and Peter-Paul-&-Mary were better known thanks to their huge chart success, but the fact is that the vast majority of those caught up in the magic of that era were ordinary folk: enthusiastic college kids, aspiring artists, terrific talents who got together and performed for the sheer musical joy of sharing songs both traditional and original. Circumstances conspired to keep the Cumberland Trio– extremely talented performers from the University of Tennessee– out of the record stores and off the charts. But that doesn’t mean that they didn’t produce excellent music. Today the best of what was lost has been found: and what a terrific “find” it is. The Cumberland Trio’s work is worth hearing, and then you’ll want to hear it over and over again. Traditional songs like “Ride Up!” (which helped them win the National Intercollegiate Folk Music competition back in the day), full of energy and drive. Original songs like “Wish I Were a Babe” (a lovely, gentle protest song and quietly powerful Civil Rights anthem) and “A Lion Named Sam” (rivaling “Puff the Magic Dragon” as a perfect children’s song). Gorgeous harmonies, brilliant instrumental work, and an infectiously energetic enthusiasm which brings all these great songs to life: with all of this and more going for them, the Cumberland Trio epitomizes the Great Folk Revival of the early 60s. It has been my privilege and pleasure to be able to play tracks from Cumberland Trio recordings on my weekly radio show– THE FOLK REVIVAL, Thursdays 7-11 PM est, wicn.org– and listeners can share in that privileged pleasure by getting hold of this CD and checking it out. You won’t be disappointed! I am a lover of folk music and have been for 50 (!) years. I am so thrilled to have found this group. They have such beautiful, tight harmony and strong individual voices. The instrumental work is prodigious…especially the banjo. I love the Beatles, but their arrival was a disaster for lovers of folk music. Thank you, CD Baby, for giving us back the Cumberland Trio. The Cumberland Trio were one of the finest groups to emerge from the 60’s Folk Boom. This album was recorded at the zenith of that boom and its stillbirth (due to the Beatles tsunami) makes it a sort of “Lost City of Atlantis.” To finally have it released is a joy–we all owe the CT a great debt. This is a must-have for any collection. Just hit “play” on your remote, close your eyes, and within only a few seconds you’re transported back to that special time when clean cut young men with their guitars and banjos hovered around a single microphone and sang tight three part harmonies with vibrant energy. If you remember that time or want to experience it, this Cumberland Trio album is a “must have”. Especially noteworthy are Tom Kilpatrick’s soaring tenor voice and Andy Garverick’s sharp, staccato four style banjo playing. All tracks are great, but two standouts are “I Wish I Were a Babe”, an original, and “Ride Up”. While a freshman at The University of Tennessee I was able to hear this group twice, the latter “In Concert” with the Knoxville Symphony Orchestra. How great that they still are making music 50 years later! 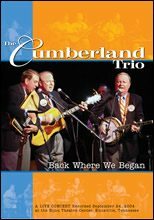 50 years later The Cumberland Trio are performing with their original line-up and have just released a new CD recorded live in 1964. If you want to revisit the folk era buy this CD to experience one of this eras finest acts. Tight vocals, harmonies and acoustic instrumentation along with traditional folk tunes will keep you humming and singing along song after song. Since I received my copy in the mail this CD has been in my CD player with the repeat button engaged. And that is the measure of an outstanding recording. Order your copy now! Awesome! Thanks for this special gift….It brings back teen-age memories of The Cumberland Trio – waaay before I had the privilege of meeting some of the group.